The history of whakairo (carving), undertaken by prisoners in Te Whare Whakaahuru (the Maori Focus Unit) at Rimutaka Prison, dates back to the time of kaumātua Jock McEwen, a Scottish writer, composer and carver who was passionate about Māori development. The Secretary of Māori and Island Affairs from 1963 until 1975, Jock McEwen in retirement masterminded the carvings for Kahukura, the meeting house at Orongomai Marae at Upper Hutt. He also led carving projects for houses at Rotorua, Pirinoa, Taita, Naenae and Upper Hutt colleges, as well as Waiouru military camp. Two six-metre pou in Wellington's Michael Fowler Centre were made under his direction by prisoners of what is now Rimutaka Prison. 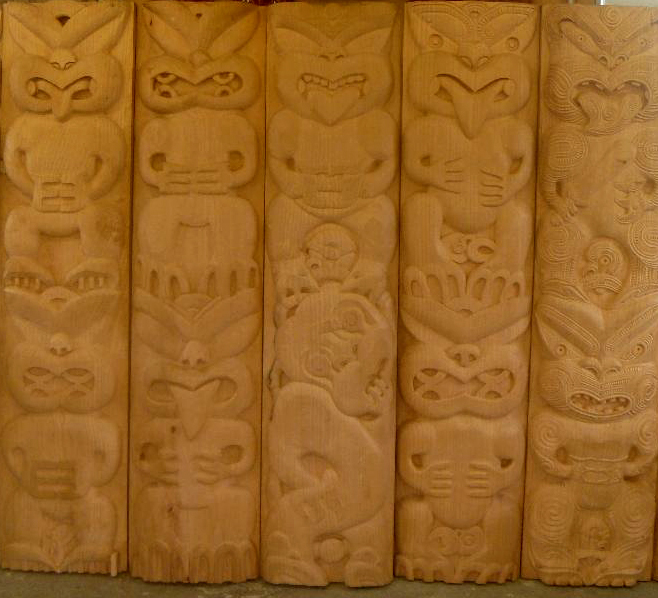 At his insistence, the carvings were created away from the prison at a whare whakairo in Petone. Prisoners were escorted to this site daily to develop skills and cultural knowledge from Jock McEwen. Later, Te Ati Awa Rangatira Ralph Love assisted him in teaching prisoners to carve at Wi Tako Prison at Trentham – now known as Rimutaka Prison. The legacy of Jock McEwen has been the subject of discussion in recent months. Moana Tipa, Prison Arts Advisor, Arts Access Aotearoa visited Te Whare Whakaahuru in November 2011, where she met with Jim Morgan, Residential Manager, and kaiwhakairo Kereopa Wharehinga. “It was late in the day to be visiting,” Moana says of this recent visit. “The wing was preparing to lock down for the evening as we approached the Maori Focus Unit, situated towards the hills at the back of the Rimutaka site. “I noticed a well-tended vegetable garden and closer to the entry, plots of well-tended roses were all flourishing. “Through the gates, we walked to the ‘carving shed’. The sense of tikanga – a tangible and established creative order and way of working – was obvious here, even though viewing was from the front of the building and some distance from the work. Still, the Maori aesthetic – the quality of carving, the generous design and skillfully carved lines – was refreshing to see. Through the vision of Jim and Kereopa, new protocols have been established. Carving is focused on community-based projects as a sole means of building skill and new knowledge, in preparation for career pathways prior to the men’s release. Kereopa has been involved with the unit’s whakairo programme for a year. “Prisoners might carve up to five hours a day. A lot of reading and research also go with this kaupapa,” he says. Photographic portfolios document the various projects undertaken by the men. Some of these projects have been commissions for Te Ati Awa and Wellington City Council, and a carved waharoa for the Makara urupa. Prior to that, a poupou was completed for Te Ati Awa and installed at the Walter Nash Park in Taita to commemorate and honour Wi Tako (Wiremu Tako Ngatata). A Te Ati Awa chief born in Taranaki, Wi Tako migrated with his people to the Cook Strait region in 1832. He was a skilled writer and throughout his life defended the cause of justice. In 1872, he was appointed to the Legislative Council. Jim Morgan continues to be prompted by the legacy of Jock McEwen and the whare whakairo established for prisoners in Petone. He is interested in seeing a similar community-based, release-to-work carving initiative established where prisoners can continue to work after their release. Original generation time 1.5263 seconds. Cache Loaded in: 0.0005 seconds.